Trying to photograph fireworks is a very hit and miss business! 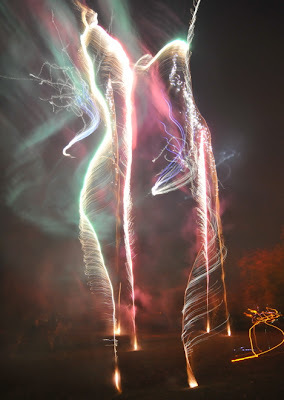 The first rule of photographing fireworks is that all the usual rules just do not apply! 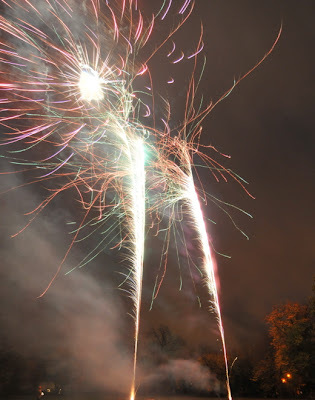 I captured these pictures and other images from Bonfire Night using the D300 and Tokina 12-24 lens on a tripod. and I used an intervalometer to take photos after each other. It looks to me, and you have to remember that the results are very random, that f/11 is not enough exposure, and f/4.5 is too much so I would reduce the exposure to say f/8. It would also be worth trying a shorter shutter speed say 4 seconds, or longer say 6 seconds. But, if you get a nicer picture you won't necessarily be able to say it was due to a different setting. Oh yes, the wind was blowing at about 5 to 10 miles per hour, which means the light traces are longer. So less wind would require longer shutter and smaller aperture. You've just got to try stuff!